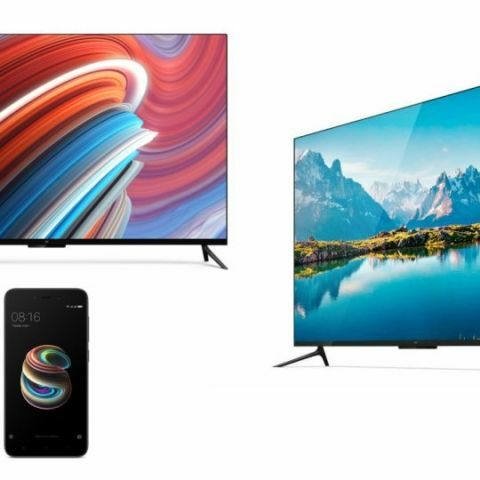 Limited quantities of the Xiaomi Redmi Note 5 Pro, Mi TV 4 and Mi TV 4A will be available on Flipkart and Mi.com today. The Xiaomi Redmi 5A will also be up for pre-orders on Mi.com. The Xiaomi Redmi Note 5 Pro, Mi TV 4, and Mi TV 4A will be up for a flash sale at 12PM today on Flipkart and Mi.com. Limited units of all three devices will be up for grabs on both websites, so get your trigger finger ready. Alongside the Redmi Note 5 Pro and the Mi TVs, Xiaomi will also be accepting pre-orders for the Redmi 5A on Mi.com at 12PM today. The Redmi Note 5 pro is available in two variants – 4GB RAM and 64GB storage priced at Rs 14,999 and a 6GB RAM and 64GB storage version priced at Rs 16,999. Coming to the TVs, the 32-inch HD ready Mi TV is priced at Rs 13,999, the 43-inch full HD TV is priced at Rs 22,999 and the 55-inch 4K HDR TV is priced at Rs 44,999. Coming to the specifications, the Redmi Note 5 Pro is powered by the Qualcomm Snapdragon 636 SoC and the first Xiaomi smartphone to support Face Unlock. The device features a 5.99-inch FHD+ 18:9 display with a 2160 x 1080p resolution. On the rear, it is equipped with a 12MP + 5MP dual rear camera setup with f/2.2 aperture lens and f/2.0 aperture respectively. On the front is a 20MP sensor with Selfie-light and Beautify 4.0 feature. The phone features a rear-mounted fingerprint sensor and is backed by a 4000mAh battery. A lot of Xiaomi smartphones are set to receive the MIUI 10 update. You can check out the list of eligible smartphones here. Coming to the TVs we haven’t reviewed the HD-ready and the Full HD variant of the Mi TV. We did however get a chance to review the 4K HDR Mi TV 4. The Mi LED Smart TV 4 features a slim, thin-bezel design and runs on Patchwall OS, which is a fork of Android, however, there is no Google Play Store support. It is powered by a 64-bit Amlogic Quad-core CPU with Mali T830 GPU and it features a 55-inch 4K HDR display with a 10-bit panel and 60Hz refresh rate. For audio, it is equipped with 16W speaker and boasts of Dolby + DTS Cinema quality. Connectivity options include dual-band Bluetooth 4.0, Wi-Fi, 3-HDMI ports (1 ARC), 1-USB 3.0 port and 1-USB 2.0 port. It offers a smarter set-top box experience with localised content in 15 Indic languages. The Mi TV 4 (55-inch) is priced at Rs 44,999. The Xiaomi Redmi 5A is powered by the Qualcomm Snapdragon 425 SoC clocked at 1.4 GHz and features a 5-inch HD display. It packs a 3000mAh battery, which claims to deliver up to 7 hours of video playback and up to 8 days of standby time. It supports expandable storage of up to 128GB via a microSD card and has a separate third slot for it. In terms of optics, it is equipped with a 13MP primary camera, which is supplemented with an LED flash and supports Phase Detection Autofocus (PDAF). On the front is a 5MP camera with f/2.0 aperture. The dual-SIM device runs on MIUI 9, based on Android 7.1 Nougat. Read our Redmi 5A review here.